Isn't it this kind of thing that makes people lose faith in local councils and become convinced they are staffed by serried ranks of the petty-minded and heavy-handed. Get paid to visit the pub? 1. Were there any door staff on the door?2. Did they ID you?3. What did you buy at the bar?4. Did the person on the bar ID you? You also need to be able to describe the person who served you and the people on the door. We also have some other yes/no questions that change for each pub. Easy! Also remember PDC web site is hard to navigate and you have to click on the words not the icons!? So if you have any views about preserving the character of our town, have your say. Dorset County Council is seeking feedback on its proposal to further reduce the hours the library is open (from 37 to 30 hours). So if you value the service, visit the library and complete a questionnaire. Or you can have your say at www.dorsetforyou.com/libraryconsultation. They have all designed a poster to celebrate what’s great about living on the Jurassic Coast as part of a new winter art project called Designosaur. These are the poster designs going up on the taxis hut opposite the Old Stone Quay - more of their artwork will be up here and at Durlston this winter. 40 children are taking part in art workshops, seafood tasting, beachcombing and visits to Durlston Country Park. This project has been funded by Community Champions. As we approach Remembrance Day, perhaps we should spare a thought for our elders who gave their efforts and survived the wars — only to be rewarded by the County Council withdrawing support for them (and their carers) just when it's most needed. (Oh, and they'll have less chance to visit the library too, as the opening hours will be reduced there). "freedom of speech" is dead ! Purbeck Community Partnership have some funding available, for projects that meet certain criteria. Essentially, there are two schemes: small grants up to £1000 and larger grants up to £10,000. Both grants must be for new initiatives (though consideration will be given to new schemes from existing groups). Closing dates for bids: 30th Nov and 30th January 2008. 8th & 9th December 2007 10am - 4pm at St Marys RC First School, Manor Road, Swanage. Come on down and join Peter the skating Penguin on the Breeze Volkswagen ice rink and pick up some presents in the Christmas themed marquee with quality craft stalls & refreshments sponsored by Ellis Jones. 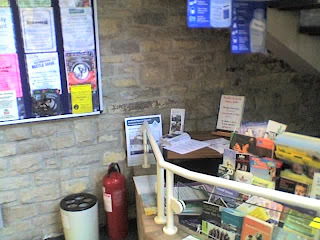 Tickets on sale at Tourist Information Office, Shore road, Swanage.